Shropshire’s fastest growing architectural practice is celebrating a record-breaking year in 2017, with more projects under way than any year in its history. 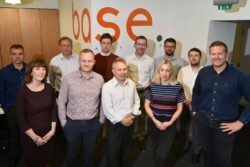 The experienced team at Base Architects in Shrewsbury is currently working on more than 170 projects covering Grand Design new builds, renovations, extensions, and urban and commercial developments across Shropshire, Cheshire and in other parts of the UK. Last year was also a record-breaking period for the business, which employs 12 people at its head office in Roushill, completing projects worth with a contract value of circa £40 million. Set up by managing director Carl Huntley 13 years ago, Base Architects has earned itself a national reputation for its innovative and environmentally conscious designs. It has also developed a niche for homes of architectural value in open countryside sites, thanks to a 100 per cent success rate at planning stage. On the back of recent growth, the practice has announced plans to open an office in Chester to serve its growing client portfolio in Cheshire, Wales and the North West. Carl, an expert in sustainable architecture and master planning, said: “This year, we’ve seen significant growth at Base, both in terms of job creation and new commissions. We currently have more than 170 live projects. “What’s interesting is the number of property remodelling projects and renovations we’re being approached to design, with more and more people looking improve the property they own, rather than moving to a new premises or home. “The demand for this type of development doesn’t show any sign of slowing down, which may be down to a reluctance to move while uncertainty remains over the economy and Brexit. “Our growth is also down to demand from further afield for our Grand Designs work, particularly those developments in areas where it may traditionally be difficult to get planning permission, as good quality design carries Planning weight. The company plans to officially launch its Chester operation with an event in September, but already staff are working on a number of projects in Cheshire and across the border into North Wales.